Initially established in 2004 as HedgeStreet, the North American Derivatives Exchange™ or Nadex as it is known, is a subsidiary of the IG Group based in the UK. The exchange specializes in providing a safe and secure environment for binary options traders to conduct their trading activities. 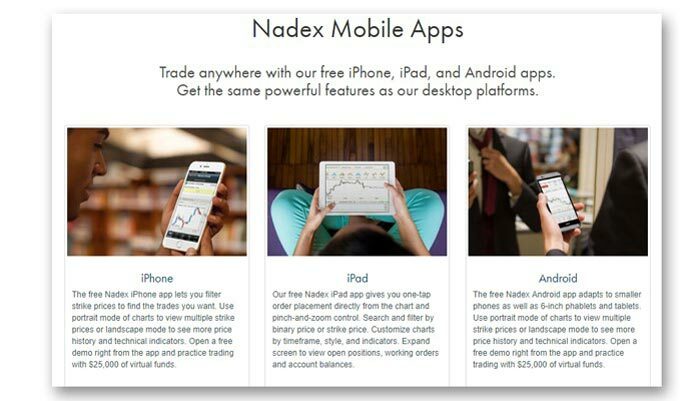 Unlike other binary options brokers that are based in Europe or offshore, Nadex is not a market maker. Instead, it merely acts as a facilitator or intermediary and matches the order from the buyers and sellers of binary options. In other words, there is no potential conflict of interest between Nadex and traders, as the exchange does not engage in any form of trading. Bought by the IG Group in 2007, Hedgestreet officially became Nadex in 2009.It is regulated by the U.S Commodity Futures Trading Commission (CFTC). Its head office is located at 200 W Jackson Blvd, suite 1400, in Chicago, Illinois. For U.S binary options traders, Nadex is one of the only binary options platforms that is approved to offer this type of trading to US clients by the relevant regulatory bodies. In addition, Nadex works on a different business model from European based binary brokers. While brokers that are offering European type binary options are essentially operating as a market maker, Nadex operates on a straight through processing (STP) business model. This mean Nadex merely acts as a platform to match the buy and sell orders from binary options traders trading on its exchange. In other words, there is no possibility of Nadex trading against you. 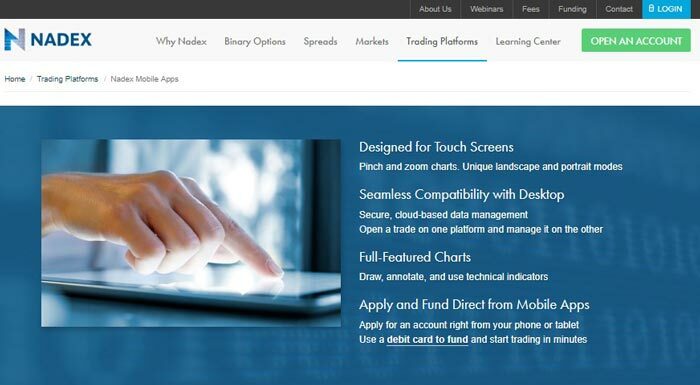 The trading platform that Nadex has provided for binary traders, is a proprietary platform. It is available in 2 versions, as a desktop platform called “Nadex Trader” and as a mobile platform known as the “NadexGO™”. Designed to be accessible from any web browser, Nadex Trader offers its users direct market access to the binary options market with full transparency. As mentioned earlier, acts as a go-between for buyers and sellers of binary options. This is based on the principle of fair exchange, where the price is determined purely by what the buyers are willing to pay and what the sellers are willing to accept. The returns of the binary options are in turn determined by this interaction between the buyers and sellers. As such, there is no direct comparison to what European based brokers have to offer in terms of return on investment. So what is our verdict on Nadex? We noted that most binary options traders used to European style binaries are confused by what Nadex has to offer them. The notion of trading binaries based on a fair exchange concept is alien to them as the binary options brokers which most of them have dealt with in the past are operating as market makers. Nevertheless, once they get past this initial hurdle, they will find that Nadex binary options are better trading vehicle and trading is conducted in a transparent manner. No. Nadex does not offer any kind of bonuses. It is not a brokerage firm but an exchange for binary options trading. It merely acts as an intermediary for buyers and sellers of binary options.